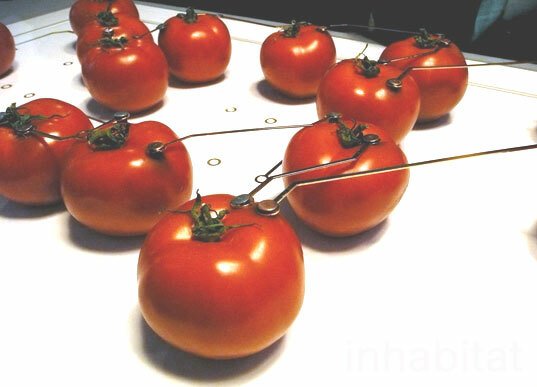 Table Lamp Powered Completely by Tomatoes! We all know tomatoes pack a powerful acidic punch, but we never thought we’d see one lighting up a room! Cygalle Shapiro of Israel-based d-VISION has created an incredible LED lamp that is completely powered by real, edible tomatoes. Currently exhibited at the Milan Furniture Fair, the design collects energy from a chemical reaction between tomato acids, zinc, and copper. This design doesn’t only explore advances in lighting technology – its also an art piece that sends clear and powerful social-conscience messages about where and how we receive energy. d-VISION‘s tomato lamp calls attention to the amount of natural resources needed to produce even the smallest amount of power for everyday living. Although the tomato lamp utilizes an organic energy source, it still takes a considerately large amount of tomatoes just to power one lamp. The lamp holds power until the tomatoes go stale, signaling a beginning and end to energy sources. The designer highlights value by creating the tomato-powered circuits and lamp completely out of gold. d-VISION is an Israeli internship program for product development and industrial design. The program’s goal is to foster the next-generation of outstanding industrial designers and to strengthen the competitive edge of the Israeli industry. The program plans to set new standards of excellence for product development and design. The Tomato-Light is currently on exhibition at the Salone Satelite ON/OFF exhibition in Milan. What a stupid idea. I wonder what the carbon footprint is for growing, harvesting, storing & delivering those tomatoes. I wonder how many greenhouse gases are expelled in building the extra square footage needed to house the tomatoes necessary to power this joke. 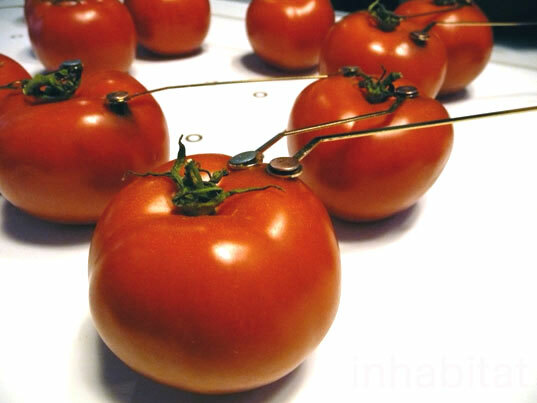 How much energy was wasted to manufacture the metal leads from each tomato. I know, it's all about the message. Well the message is: you can't build a viable alternative. The message is: I don't care how much energy I waste in the process the end result, the art, is all that matters. The ends justify the means. The message is: I'm a hypocrite. Nice idea, but as a chemist, I dislike your description of where the power is coming from. The power to run the LED is due to the choice of metals stuck into the tomatoes, and not from the tomatoes themselves. The tomoato (or lime, or lemon) only acts as an electrolyte for the current to pass through. We all know tomatoes pack a powerful acidic punch, but we never thought we'd see one lighting up a room! Cygalle Shapiro of Israel-based d-VISION has created an incredible LED lamp that is completely powered by real, edible tomatoes. Currently exhibited at the Milan Furniture Fair, the design collects energy from a chemical reaction between tomato acids, zinc, and copper. This design doesn't only explore advances in lighting technology – its also an art piece that sends clear and powerful social-conscience messages about where and how we receive energy.